You ve never seen Droids like this before! Never before made as toys, these new figures incorporate some of the finest Droid designs out of Hasbro and the engineers of Industrial Automaton. 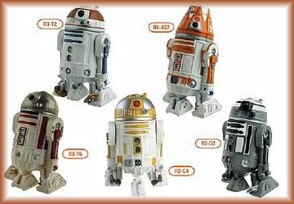 Each droid has several points of articulation, with articulated feet, moving domes, retractable third legs, and all sorts of light-up eyes, clear domes, and other features that bring these unique droids to life!